The systems development life cycle (SDLC), also referred to as the application development life-cycle, is a term used in systems engineering, information systems and software engineering to describe a process for planning, creating, testing, and deploying an information system. The systems development lifecycle concept applies to a range of hardware and software configurations, as a system can be composed of hardware only, software only, or a combination of both. There are usually six stages in this cycle: analysis, design, development and testing, implementation, documentation, and evaluation. The SDLC is not a methodology per se, but rather a description of the phases in the life cycle of a software application. These phases (broadly speaking) are, investigation, analysis, design, build, test, implement, and maintenance and support. All software development methodologies (such as the more commonly known waterfall and scrum methodologies) follow the SDLC phases but the method of doing that varies vastly between methodologies. In the Scrum methodology, for example, one could say a single user story goes through all the phases of the SDLC within a single two-week sprint. Contrast this to the waterfall methodology, as another example, where every business requirement (recorded in the analysis phase of the SDLC in a document called the Business Requirements Specification) is translated into feature/functional descriptions (recorded in the design phase in a document called the Functional Specification) which are then all built in one go as a collection of solution features typically over a period of three to nine months, or more. 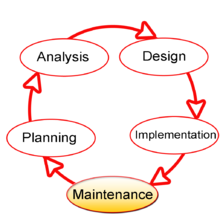 These methodologies are obviously quite different approaches, yet they both contain the SDLC phases in which a requirement is born, then travels through the life cycle phases ending in the final phase of maintenance and support, after-which (typically) the whole life cycle starts again for a subsequent version of the software application. ^ Parag C. Pendharkara; James A. Rodgerb; Girish H. Subramanian (November 2008). "An empirical study of the Cobb–Douglas production function properties of software development effort". Information and Software Technology. 50 (12): 1181–1188. doi:10.1016/j.infsof.2007.10.019. ^ "Systems Development Life Cycle from". FOLDOC. Retrieved 2013-06-14. ^ "Software Development Life Cycle (SDLC)". ^ Taylor, James (2004). Managing Information Technology Projects. p. 39. ^ a b Geoffrey Elliott & Josh Strachan (2004) Global Business Information Technology. p.87. ^ a b c d US Department of Justice (2003). INFORMATION RESOURCES MANAGEMENT Chapter 1. Introduction. ^ Unhelkar, B. (2016). The Art of Agile Practice: A Composite Approach for Projects and Organizations. CRC Press. pp. 56–59. ISBN 9781439851197. ^ Kay, Russell (May 14, 2002). "QuickStudy: System Development Life Cycle". ComputerWorld. ^ Taylor, G.D. (2008). Introduction to Logistics Engineering. CRC Press. pp. 12.6–12.18. ISBN 9781420088571. 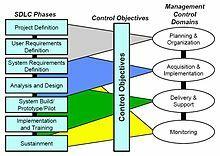 ^ Control and Audit, Information Systems. SDLC (August 2013 ed.). Chapter 5: Institute of Chartered Accountants of India. p. 5.28. ^ Radack, S. (n.d.). "The system development life cycle (SDLC)" (PDF). National Institute of Standards and Technology. ^ Marakas, James A. O'Brien, George M. (2010). Management information systems (10th ed.). New York: McGraw-Hill/Irwin. pp. 485–489. ISBN 0073376817. ^ a b c d e U.S. House of Representatives (1999). Systems Development Life-Cycle Policy. p.13. ^ a b Post, G., & Anderson, D., (2006). Management information systems: Solving business problems with information technology. (4th ed.). New York: McGraw-Hill Irwin. ^ Blanchard and Fabrycky (2006). Systems Engineering and Analysis, Fourth Edition. Prentice Hall. p. 19. ^ Dr. Joahn Gouws (2007). Introduction to Engineering, System Engineering. Melikon Pty Ltd.
^ Cunningham, James. "HERC Maintenance". Fargo. XXI (North Avenue): 49. Retrieved 13 May 2009. This page was last edited on 1 April 2019, at 14:58 (UTC).